Any kind of major electrical fault around the house will need to be repaired by a professional electrician. However, that said, there are a few everyday electrical tasks that aren’t complicated, or dangerous, which you could attempt yourself. The most important thing to remember is to switch off and unplug whatever it is you need to work on so there’s no danger of a live current. The first thing to do is find your main fuse box (these days called a consumer unit), which will be in the same place as your electricity meter. They’re often in the main hallway of a house, in a purpose-built cupboard. This is where the electricity in your house is controlled from, and it’s important that you know where to go and what to do if you need to turn off the mains electricity. It’s also helpful to remember where you left a torch too! Your fuse box, or consumer unit, will either have fuses or trip switches. Modern electric circuits are fitted with a circuit breaker fuse system; if a fault develops, a switch is tripped and the circuit is broken. Older ones have fuse holders and when a fuse is blown it must be replaced or rewired. If you experience problems with an old-fashioned fuse box, it might be sensible to install a replacement which conforms to current regulations for ease, safety and peace of mind. If you need assistance with any kind of electrical installation we would recommend calling out a qualified electrician. Open the cover on the consumer unit to see which switches have tripped to the OFF position. Put them back to the ON position. If tripping occurs again, it is probably being caused by a faulty appliance. You need to identify which circuit is affected and which appliance on that circuit is causing the problem. What causes it to trip or blow a fuse? – Faulty connections on leads to appliances e.g. televisions or stereos etc. Most plugs will have a fuse inside them. 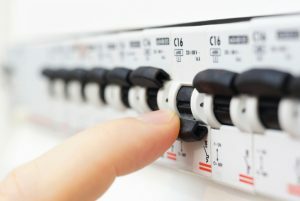 If the appliance suddenly stops working, it is worth replacing the fuse inside the plug before calling an electrician. To find out the correct type of fuse to fit in the plug, check the rating plate on the appliance. Do not overload plug sockets by using multiple plug adaptors. Replacing the plug on an appliance is fairly straightforward, and is well worth doing before you declare your electrical appliance broken.